Please make sure to keep your child's Emergency Contact information up to date. There are two ways to update your contact information: come into the office to inform a staff member or go online to the Parent Portal before Septenber 30, 2018 to change your contact information. Need to create a Parent Portal account? Please see the instructions below to create and/or access your account. 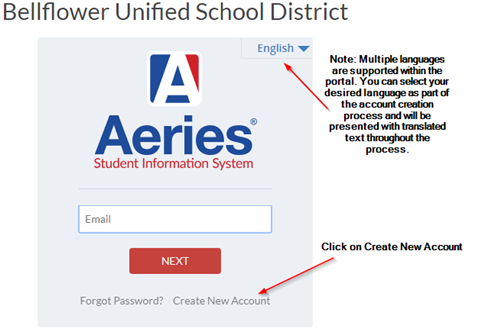 First, open the BUSD Parent Portal website by clicking here. Once the login screen appears, click on the Create New Account link. The Parent option should have a black dot in the circle. If not, click on the circle next to Parent to insert the black dot. Type in your email address in the Email Address and Verify Email Address boxes. Type in a password that you will use each time you log in to the Parent Portal. Retype your password, Then select the Next button. After that step, an email will be sent to the email address you entered. You must log in to your email account. You must open the email you received from noreply@busd.k12.ca.us in order to continue creating your new parent portal account. Do not reply to the email. Confirm your email address by clicking on the Confirm This Email Address link found inside the email, or copy and paste the email code found at the bottom of the email into Step 3 on the Parent Portal Website. Once your email has been verified, you will see a confirmation page and can continue with the registration process. Click on Return to Login Page. Verify your student's information by entering the 10 digit permanent ID number, the home telephone number, and the verification code that are provided by the student's school, and then click Next. The parent is presented with a list of all contact records for that student. This only applies if the account was created as a Parent account, and there is at least one contact record for the student. When a name is selected and the parent clicks Next, the account email address will attempt to populate that contact record’s e-mail field. 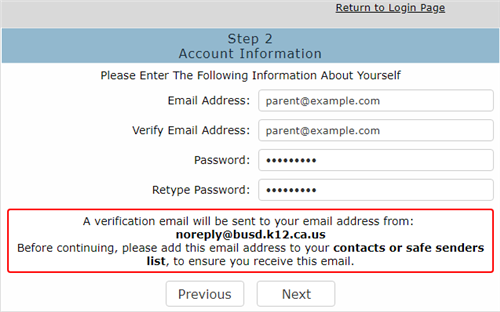 If the contact record has an existing email address populated that is different than the account email address, the parent must click OK to replace it. Once overwritten, an email will be sent to the old email address informing the owner that the email address stored in Aeries has changed and to contact the school if there is a concern. 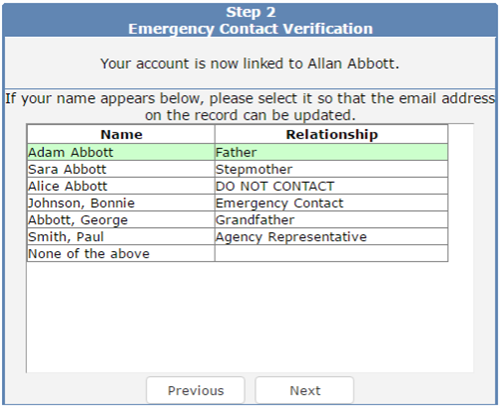 If the parent selects “None of the above” no contact records will be updated. Now that the account is created and linked, the parent can use the login page to login to the portal and view the information about their associated student. Adding an additional student to the account can also be done at this time by clicking the Add Another Student to Your Account button. The Aeries Parent and Student Portals allow individual parent accounts to be associated with multiple students. The account can even be associated with students from different schools within the same District. This means that parents only need one username and password to access all their students. You will need the three pieces of required information before you can add another student to your existing account. To add a new student to an account, first, log in to Parent Portal. The menu shows Change Student, a dropdown list of students currently assigned to this account are listed as well as the option to Add New Student To Your Account. To add additional students, you will be prompted for the Student ID, Primary Telephone Number, and Verification Pass Code (VPC). 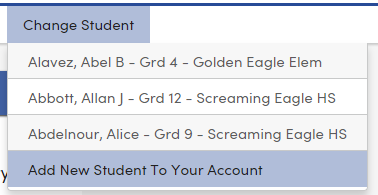 You will then see the students added to the Change Student dropdown and can easily switch between them by clicking on the student’s name.